I finished it! Yes I did! And this one could convince me to like strings! Especially bright ones. I made the top a while ago and have never written up the pattern, but I thought I'd go ahead and do this one for you since I've had several people ask for it. When you see me doing these swirl/feather fillers, you know I have garnered all my courage and gone for broke! This is what I'm going for! This you tube video was done by Amanda Murphy, I believe. I just tried to link to it here and it showed up! Check it out - it’s my goal to have my FMQ as nice as hers. 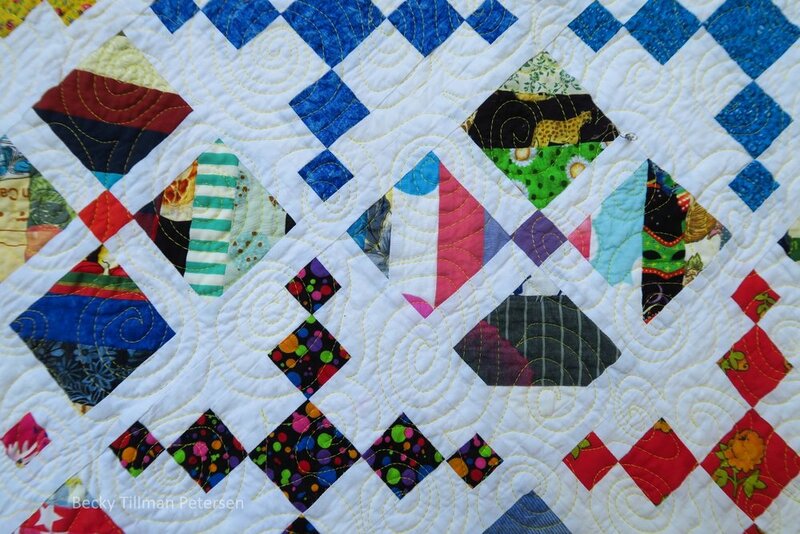 When you quilt this densely the quilt gets pretty flat. But here’s the quilt roll. I've created a page on the website with my Crumbs and Strings project. You can there any time to see where I am with these. I will try to keep it updated after any major finish. I may not keep the current strings or crumbs project updated but especially after I feature a quilt on the blog, I will try to get that new picture in its place. I'd like to eventually see a nice series just like the upcycled blues ones. If I have a pattern finished for these quilts, you should be able to click the picture and find the pattern. Most of them don’t have patterns, however. At least not yet. I will also put the patterns on the free patterns page - where this one is as well! Have a great day, wherever you are reading this! Be sure to check out what my sis has for you over in the store! She’s working hard to keep you in fabric you can afford! This fabric is part of a entire collection of fabrics that are beautiful together or separate featuring bright reds, pinks, blues, golds and greens in vibrant hues. Summer's Over - Did I make any headway?